Is all arranged on the one level : Fully fitted kitchen with dishwasher, washing machine, microwave, oven, hob, fridge freezer, with patio door to small terrace. Lounge / dining room with TV and DVD. Patio doors to covered terrace overlooking the beautiful large pool and spacious lawned garden areas. Double bedroom with en-suite bathroom (with a shower inside the bath). Twin bedroom with patio windows to the garden terrace and an ensuite bathroom (with a shower inside the bath ). Twin bedroom . Bathroom (with a shower inside the bath ). No smoking is permitted inside the apartment. Service: Our property management office is 1km from the apartment and they offer friendly advice, help and assistance to all our guests including a welcome visit to introduce you to the apartment and surrounding area. They also sell tickets to waterparks, boat trips and excursions at discount prices. There is also an emergency telephone Nº provided. All guests receive a welcome food pack with our compliments. Activities: Zoomarine Park (sea life): 10min drive; Two Waterslide Parks: 10min & 20 min drive; Horse riding over the sand dunes: 5min drive; Water sports & jet ski on Galé Beach; Big game & Reef fishing from Albufeira marina just 5min drive; Krazy World (zoo & mini golf): 20min drive; River trips, Jeep Safaris, Sea day trips with barbecue on a secluded beach; Excursions to local markets and other places of interest in the Algarve, to Seville and Lisbon. Great location. Pool fabulous. Comfortable sun loungers and sitting room. Apartment very good generally but desperately in need of work. Bathrooms have black mould. Beds uncomfortable. Kitchen very well equipped but lights above units crumbling and look unsafe. Washing machine door about to break. Blinds not working. Would take very little to sort this out and then it would be amazing!! Very nice and surprisingly big! Stayed here in July with my family and parents so 6 people in total. I was really wary about getting an apartment as I thought it would be too small for all of us. However we were pleasantly surprised, rooms are really good sizes and not even a minutes walk and you're at the pool. The apartment is nice and bright, kitchen has everything you need and the air con was awesome. The only two things I would say could be improved were the mattresses they were was way too hard, may be an idea to invest in decent mattresses, the second would be to put in satellite TV and broadband. When the kids were in bed the only English Channel at night was the news. I can't comment on maid service as they never appeared, they only changed towels.... and took one of my own towels!!! Would definitely recommend though. 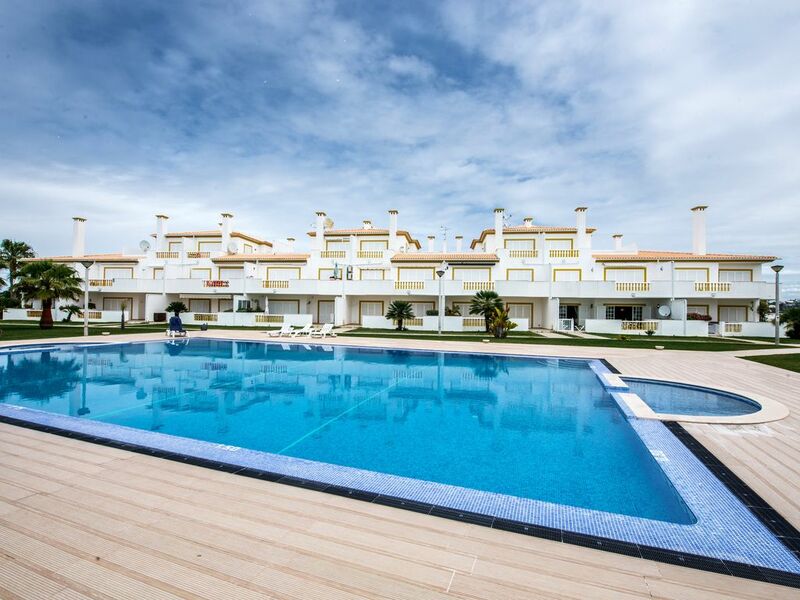 Well equipped spacious apartment with a great pool and tennis court on site. We stayed in a ground floor apartment which gave great access to the outdoor facilities. Large outdoor area and bbq, we hardly spent any time indoors. Few minutes walk to lovely beach and plenty of quieter coves if you walk a bit further. Would have no qualms about staying here again. A well equiped and comfortable appt. Although part of an appartment complex, its position at one end and on the ground floor makes it quite secluded. It is spacious, comfortable and well equipped. The complex's swimming pool is large with plenty of space for loungers. There are sufficient restaurants and a supermarket in the immediate vacinity and good beaches are only about a 10 min walk. We would book it again. We are very pleased that you did enjoy your stay at the Apartment, the apartments are nicely furnished, spacious and quiet even it is a complex. The Algarve, located in the south of Portugal, offers ideal features for a wonderful holiday: practically year-round sunshine, golden sandy beaches with bars/restaurants, some of Europe’s best golf courses (20+), 'Monchique' mountain, romantic hidden towns, good value restaurants. Albufeira town is 4kms, around 5 min drive. The old town is very interesting with narrow cobbled streets and old fisherman houses and then there are the numerous music bars and street entertainers together with regular free shows in the main square in the summer season. Algarve Shopping, the biggest shopping centre in the region with several shops, restaurants,hypermarket (open Mon-Sun until 11:00 pm) is at Guia, a small town famous for many good value restaurants specialising in 'chicken piri piri', only 5min drive. Prices shown are for up to 6 persons. Discounts are available for under occupancy in all seasons except Peak - please request. Prices up to 4 persons: Low - 406£ pw Mid - 560£ pw High - 690£ pw Winter let available (PRICES ARE FOR 4 PEOPLE) - Price doesn´t include electric, maid service and laundry. If you would like to have maid service during your stay you have to pay extra 9€ per hour.